I have this affinity with old stuff. Antique stores, old houses, old cars, old recipes. I use to go to those storage auctions and bid on storage units just so I could go through people's old stuff. Honestly I just love walking through antique stores and looking at everything inside. I think I was born in the wrong year. I always wish I lived during the 50s. Maybe I have watched one too many episodes of I Love Lucy, but it just looked so much more real. All the women got dressed up to go to a show, people would sit around and listen to the radio and play board games and have actual conversation instead of watching tv all day long and scrolling through Instagram. It seemed like simpler times and honestly just so much more happy. For some reason when I look at antiques I get excited thinking about the person that was once super excited to be using whatever it is I'm looking at. Like the old desk that was once brand new. Whoever had it was probably so excited to bring it home and walk by it and admire it. Do you do that? I love getting new art in my home or new furniture. We have this piece of art in our house of a bird flying over LA. I absolutely love it and I always walk by it and say "gosh I love that picture" and the kids always laugh. Now it's a joke every time we walk by it. It just makes me happy. This house that I bought is pretty happy. Well it's actually a little cold and desolate and creepy right now, but you know what I mean. Overall it makes me feel good. I can see the charm through the dirt and I want to make it sparkle again. There are three bathrooms in this house. One powder room downstairs and two bathrooms upstairs. This bathroom is for the second bedroom and Lily and Olive are obsessed with the pink tile. Unfortunately the color doesn't really jive with what I have planned so I can't keep it. It's also cracked everywhere and ummm slightly dated ...... The house was built in 1927 and this bath was added sometime in the 50s/60s. The bathroom is fairly large, but it's not actually connected to the bedroom so I need to wall in the existing door and create a door into the bedroom so it's not just floating around in the hallway. I am also going to borrow part of this bathroom for the master closet. The bathroom is big and the master closet is like the size of this shower door so that ain't working for anyone. I have never met a girl that only has 4 pairs of shoes so Mama needs to make the closet a real closet. Sorry pink bathroom, but we gotta split you up! Scroll down to see the before pics and what my plans are and let me know what you think! This was the first picture I ever took in the house. It's my favorite room and well, I really, really like taking showers. This oversized mirror is a really deep medicine cabinet and underneath this counter is actually a pedestal sink which I would love to reuse downstairs in the powder bathroom, but I'm not sure if I can salvage it without damaging the edges. The cabinets were just built around it and there is no bottom to this cabinet so if you look underneath it, everything is just sitting on the floor. Weird. The window will be staying here and I love these old thermador grates, but is that weird to leave them?? I just love the look of them even if they don't function! Thoughts? I think they are so cool looking! They add so much character and I feel like they are true to the house. Do you think it's weird to leave them though? I actually really love the mirrors and think I can reuse them in a more modern way so I am going to be saving them. They will no longer be medicine cabinets but I'm going to take off the wood and add brass to the sides. I am also saving the soap dish and I plan to incorporate it back as a throw back to what was originally here. This is the existing floor plan and as you can see the bathroom backs up to a pretty large attic. The master closet is what you see in yellow and it's awful. Did I tell you how awful it is? Yeah just wait till I post those pics. I will be taking part of the second bath to widen the closet. I will also be taking the linen closet in the hallway and using part of the attic area behind it which is currently labeled as "closet". Alrighty, so this is my inspiration for the room. I want to incorporate green penny rounds on the walls and ceiling. It's a take on what is originally here but it will be more modern. I am going to use moss green penny rounds and gray grout. The floor will actually be white marbles it's clean and it doesn't fight with the tile. This picture is simply for the penny rounds. Classy, sleek, modern, yet perfect for this 91 year old house. 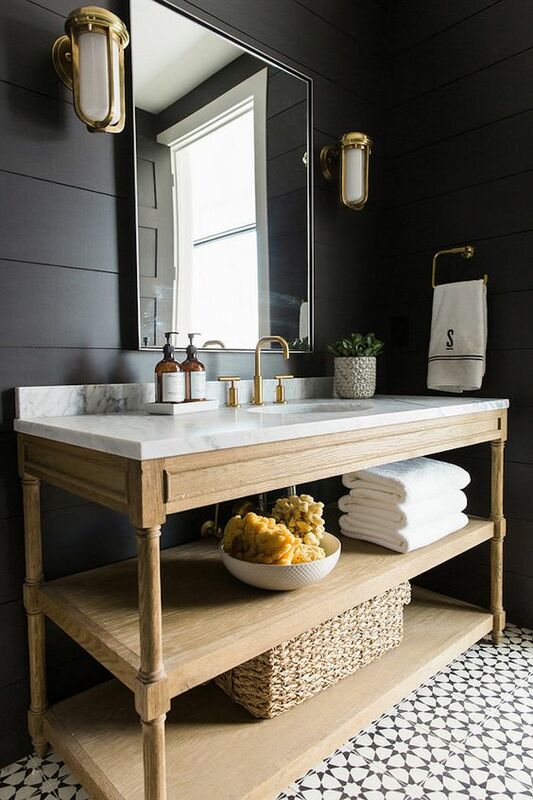 Go with a wood vanity that's clean and simple. The white marble will match the floor and I will have a brass faucet and a dark framed mirror. I love the idea of doing a simple wood vanity with no hardware because I don't like seeing a bunch of hardware. I think people can get carried away sometimes with too much brass and this keeps it minimal. Thoughts on which direction I should go? Please let me know your thoughts and what you think!